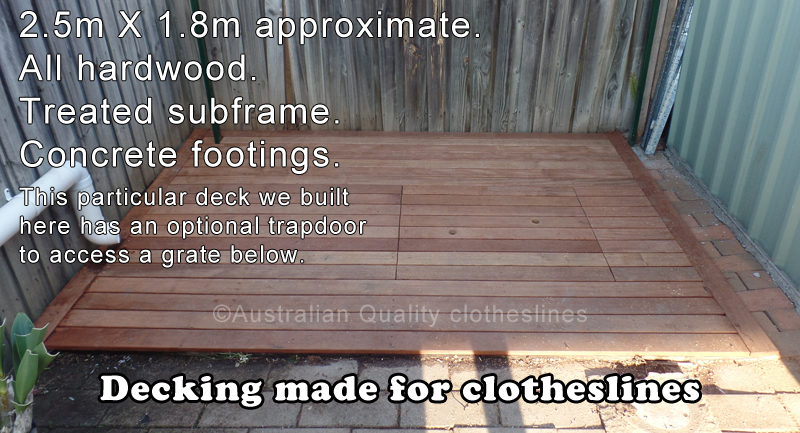 Clothesline decking made to suit. We can build you a deck for your clothesline or we can lay pavers, pebbles, almost anything you like. For a hardwood deck approx 2.5m wide x 1.8m deep all inclusive with materials and labor the price is only $1499. This includes concrete footing where applicable. Treated hardwood subframe, hardwood deck top timbers all screwed in with stainless steel screws. Please Contact Us for a new deck. Available in the Sydney area only.